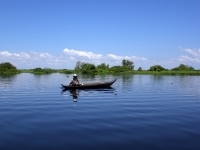 Boeung Tonlé Sap (Tonlé Sap Lake) is one of the largest freshwater lakes in Asia, containing a rich and diverse eco-system. Inhabitants include multiple bird and fish species, crocodiles, turtles, macaques, and otters, as well as villagers living in stilted or floating houses. The Prek Toal Bird Sanctuary in the Tonlé Sap Biosphere Reserve is home to ibis, stork, pelicans, and fish eagles; the best time to view these birds is in the dry season. There is also a Tonlé Sap Exhibition in Siem Reap, showcasing Khmer heritage through a display of the local people's culture and environment. Boat tours on the lake are popular and an enthralling way to see the riverside villages and interact with the locals. Be aware that while the majority of guides are friendly and competent, there have been reports of some trying to scam tourists and charge ridiculous rates for boat trips. It usually costs well under $20 to hire a boat and you can share it between a few people. Tips for the guides are also expected.